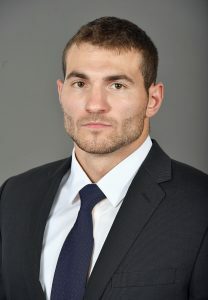 LOGAN, Utah – Mike Caputo, an All-American safety at Wisconsin, has been hired as Utah State’s safeties coach, it was announced Tuesday by Aggie head football coach Gary Andersen. Caputo (Ku-pooh-toe) comes to Utah State after spending the past two seasons as a defensive graduate assistant at LSU working with former USU defensive coordinator Dave Aranda. During his two years in Baton Rouge, Caputo helped the Tigers to a combined 18-7 record, including a 11-5 mark in the Southeastern Conference, and back-to-back New Year’s Bowl games. Caputo played safety at Wisconsin from 2012-15, including two seasons under Andersen. In all, he played in 53 games, making 40 starts, and was part of a senior class that posted a 38-16 record over four years, including wins in the Outback (Jan. 1, 2015) and Holiday (Dec. 20, 2015) bowls, in addition to the 2012 Big Ten Championship and 2014 Big Ten West Division title. For his career, he recorded 244 total tackles, including 10.0 tackles for loss, while adding three interceptions, 20 passes defended, four forced fumbles and five fumbles recovered, while notching six career double-digit tackle games. In all, Caputo started 39 out of a possible 40 games during his final three seasons in Madison and earned second-team All-America honors from the Football Writers Association of America (FWAA) following his junior campaign. As a junior, he led the Badgers with 106 tackles, which included 1.0 sacks and 6.0 tackles for loss, while adding four forced fumbles, two fumble recoveries, one interception and six passes defended. Caputo, who was named a consensus second-team all-Big Ten safety as both a junior and senior, posted 65 tackles, to go along with two interceptions, two fumble recoveries, one forced fumble and eight passes defended during his senior season. He then played in the 2016 East-West Shrine Game and earned Defensive MVP honors after recording three tackles and two interceptions. As a sophomore at Wisconsin, Caputo earned honorable mention all-Big Ten honors from the media as he ranked second on the team with 63 total tackles. Following his collegiate career, Caputo received a training camp invitation from the New Orleans Saints and later signed a free agent contract with the Los Angeles Rams prior to the 2016 season. Caputo graduated from Wisconsin in 2015 with degrees in life sciences communication and certificate in entrepreneurship.